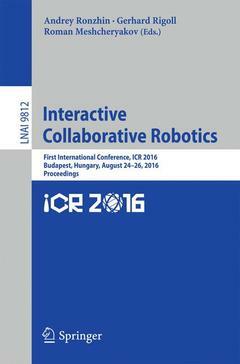 This book constitutes the proceedings of the First International Conference on Interactive Collaborative Robotics, ICR 2016, held in Budapest, Hungary, in August 2016. The 29 papers presented in this volume were carefully reviewed and selected from 48 submissions. A Control Strategy for a Lower Limb Exoskeleton with a Toe Joint.- A Recovery Method for the Robotic Decentralized Control System with Performance Redundancy.- An Analysis of Visual Faces Datasets.- Attention Training Game with Aldebaran Robotics NAO and Brain-Computer Interface.- Conceptual Model of Cyberphysical Environment Based on Collaborative Work of Distributed Means and Mobile Robots.- Control Method for Heterogeneous Vehicle Groups Control in Obstructed 2-D Environments.- Decentralized Approach to Control of Robot Groups During Execution of the Task Flow.- Development of Wireless Charging Robot for Indoor Environment based on Probabilistic Roadmap.- Distributed information system for collaborative robots and IoT devices.- Designing Simulation Model of Humanoid Robot to Study Servo Control System.- Educational Marine Robotics in SMTU.- Human-Machine Speech-Based Interfaces with Augmented Reality and Interactive Systems for Controlling Mobile Cranes.- Human-Robot Interaction using Brain-Computer Interface based on EEG signal decoding.- Interactive Collaborative Robotics and Natural Language Interface based on Multi-agent Recursive Cognitive Architectures.- Mechanical Leg Design of the Anthropomorphic Robot Antares.- Method of Spheres for Solving 3D Formation Task in a Group of Quadrotors.- Mimic Recognition and Reproduction in Bilateral Human-Robot Speech Communication.- Multi-robot Exploration and Mapping Based on the Subdefinite Models.- Positioning Method Basing on External Reference Points for Surgical Robots.- Preprocessing Data for Facial Gestures Classifier on the Basis of the Neural Network Analysis of Biopotentials Muscle Signals.- Proactive Robotic Systems for Effective Rescuing Sufferers.- Robot Soccer Team for RoboCup Humanoid KidSize League.- Semi-Markov Modelling of Commands Execution by Mobile Robot.- Smart M3-Based Robot Interaction Scenario for Coalition Work.- Speech dialog as a part of interactive "human-machine" systems.- The Humanoid Robot Assistant for a Preschool Children.- Voice Dialogue with a Collaborative Robot Driven by Multimodal Semantics.- Volumetric Display Testing Unit for Visualization and Dispatching Applications.- YuMi, Come and Play with Me! A Collaborative Robot for Piecing Together a Tangram Puzzle.